A few weeks back I unearthed some old photographs from my mom’s high school days and before I knew it I found myself spending the day trapped in a tower of stacked photo albums. Each album felt like a collection of short stories. 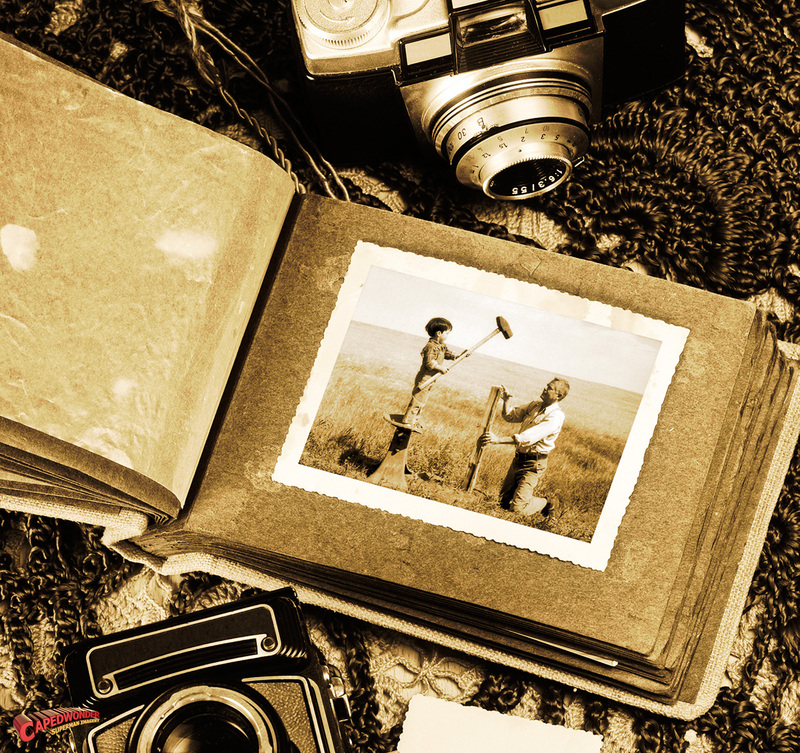 I recalled how special and exciting photographs were a decade back. How I would use the photos my Kodak reel would grant me so sparingly. How I would eagerly wait to get them developed. How I would hold them almost respectfully, by the edges to make sure I didn’t leave finger prints on them. How my parents would indulge me with pretty photo albums and how I would spend hours captioning my photos and slipping them in. These photographs had an unexplainable sense of dignity that I believe facebook profiles will never achieve. Social networking has robbed photos of their soul and depth. Photographs no longer tell stories. They lie. They paint a picture of our lives so deceptively that we’re almost convinced that perfect hair and an extensive wardrobe is really whats worth aspiring for. Memories are no longer personal journeys. They’re conditioned, manicured and tweaked to be in line with the experiences we want people to believe we’ve had. Flipping through a photo album was often a post-dinner family affair. They were once a catalyst for conversations, laughter and tears. The best part about these photos was that they would soon be forgotten about and would hibernate in those albums until someone stumbled upon them months later. Today, every waking hour of our lives have been documented with such untiring, relentless passion. Every one of these moments is so accessible and so often viewed on Facebook, Instagram and Twitter, we’re denying ourselves the beauty of reminiscing. It makes me realise that we’re doing photographs all wrong. That my children will never feel the way I did about my mother’s photographs. I realise how mundane they would think my assortment of #goodhairday selfies are. How they would never know the effort that went into finding that perfect angle to hide my paunch, thunder thighs and manly shoulders all at once. I wonder if itll make a difference to them that I spent 20 minutes this morning trying to pick between Amaro and Walden. I wonder if they’ll notice, that though it’s the same poses, same places, same people, my outfits were always different. My father took several photographs of my mother in the hospital the day I was born. Flipping through the album, I realised how beautiful pictures of a tired young mother in a baggy hospital gown can be. How there is no such thing as a bad angle or a bad hair day when the moment is that precious. I realise that the difference between photographs then and now is that it was valued by how it made you feel, not by how you looked. How a memory that matters cannot be made more beautiful by increasing the saturation. That filters simply dilute the beauty of a memory, like a girl who wears too much make up. And how easy it is to forget the essence of a moment when you’re so lost in making it pretty for the world. I wonder how radically different our pictures would be from our facebook profiles if we each started our own photo albums. If no one would see them and all that mattered was revisiting a significant place in the past. We’ve grown to underestimate how wondrous it really is that a moment in time can be captured and preserved forever. Its for that feeling you have when you stumble upon an old photo album that I believe the camera was invented in the first place. How for a few seconds, you can revisit happier, simpler times before snapping back into reality. How for a few seconds, we had created a time machine. awesome read Krishna – keep it coming! Exactly. I’m admittedly big time into selfies but they’re just a careful (and rather narcissistic) way of controlling exactly how you look. Film just had more soul, in my opinion. You never knew how your photo was going to turn out and that just makes it more special. Krshna, interesting insight. I completely agree that selfies project what you want projected and not necessarily the real emotions behind it. I also think it may not be as much about print or digital pictures as much as it is about the numbers of them also. The more you have of something the less you will value it (old jungle saying!!) and its the same with the pics. With a surfeit of digital pics, have they become too routine and possibly less appealing? In my view,there are certain things simply personal in our lives which were captured as private and sacred by using the cameras of yore.While there is nothing wrong in getting the selfies in the public domain,there seems to be a restless urge to project that life is always hunky dory and that one would like the world to be remembered that way only day after day! Today,it is as though life seems to be projected as a harmonic orchestra sans cacophony of any kind!That is the point which,to me,is far from reality! Completely agree! 🙂 Its almost gets competitive! We should all catch up soon! Deep insights Krshna. You are overtaking your father….:-). Amidst the cacophony we have to decide where the locus of control is. Though it is difficult in this world of fast forward! A few days ago, I was introduced to your blog by a friend of mine who’s a big fan of yours. First of all, I have to say, you write really really well, and I love how you can make wonderful stories about simple things. I read every word you post. Now, the other point of this comment. I study in Christ University, in the Department of Management Studies. Our department publishes this magazine every year, where students get to send in original articles, paintings, drawings, poems and the like. When I opened the issue we were given today, I came across an article that was strikingly familiar to this post at first glance. With further inspection, I could tell it was the exact same thing. Owing to the fact that I have been following your blog and I know that this wonderful article of yours is definitely a creation of your own, I knew that the one in our magazine was plagiarised word for word. I wanted to go straight to the girl, drag her to the editor and let them know what she had done so she would get what she had coming, but I was advised to let you handle this matter in the way you felt was right, so I am writing to you. I have taken pictures of the article and the girl who claims to be its author, which I will link to you. I urge you to contact the editor of this magazine (I can email you contact details if you need them) and defend the ownership of what you created. I cannot stand plagiarism and I hope I’ve done the right thing. Ohmygod. Thank you so so much for bringing this to my attention.Yes, please give me the contact of the editor of the magazine. I will send him a mail as soon as I can. I have written to the girl under who’s name the post was published as well. 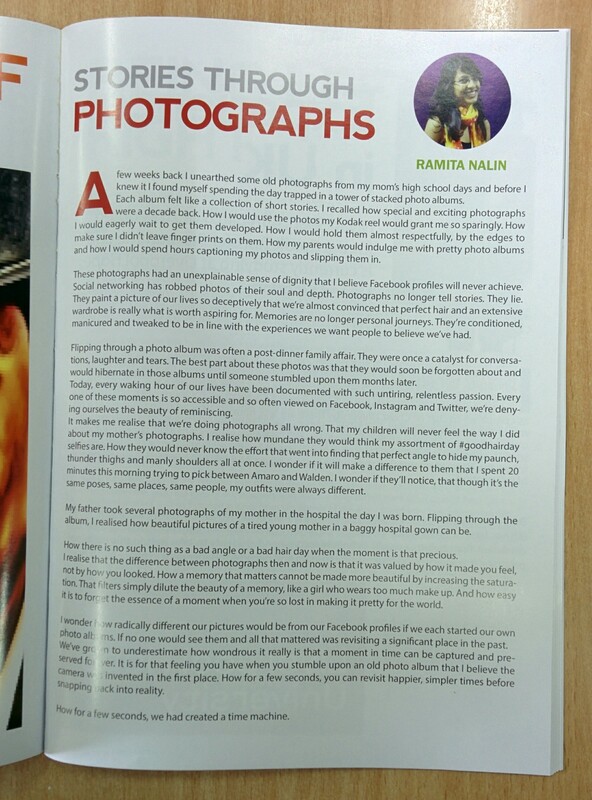 Cant thank you enough 🙂 I was asked for permission to publish this post in the Chirst magazine under my name and I told them it was okay. Didnt think it would turn out like this at all. From somewhere and somehow I landed on your blog. Went through some of them, absolutely loved them. And this one, among all, touched me the most. Being a photographer, I understand every word and every line of thought you have written. 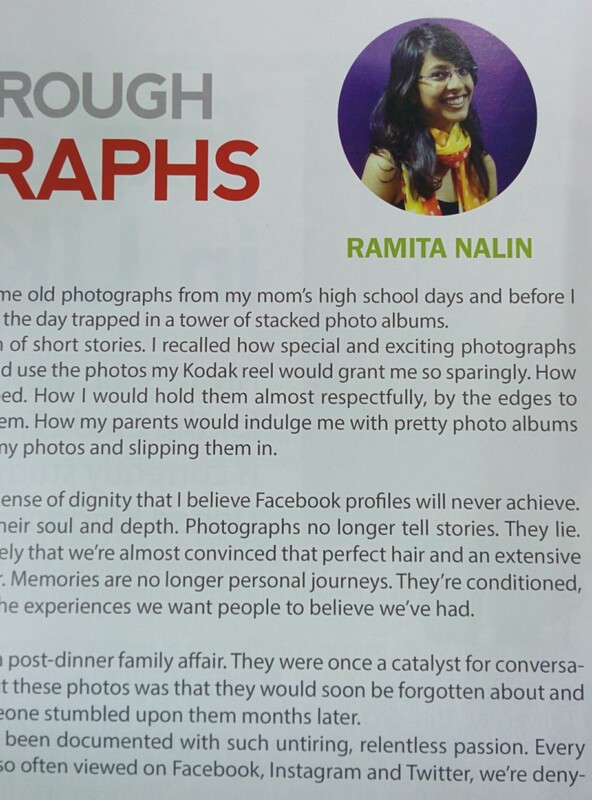 “Photographs no longer tell stories. They lie..”, “..Memories are manicured..” – you can’t imagine how strikingly true this is, and every day I try hard to tell a story through my picture and there are plenty born with Instagram filters. Beautifully written, all of them! Keep it going, and yeah, the recent one on Bangalore, is special. Thank you so much for your comment. The feedback and encouragement is so rewarding! So glad you managed to chance upon my blog! Photographs were to be the mirror of our memories. I have a pile of them before I got addicted to the digital world. But, when my daughter turned 18 few months ago, she helped me pick the best ones(oh over 100 of them) and we put them up as the party backdrop. Her friends got a glimpse of her childhood through my eyes with their smiles. I have captured those moments too digitally, of course. But, I really do understand and feel your angst that the papery matt kind of memories are slowly fading away. Make some more if you can. Yes, luckily for me, I have big family (sisters & their kids)here and seeing each child grow up and going through the sane emotion with each of them, I try to recapture the same happiness with them too. I am an avid photographer too, so, double lucky. If you do have time check out my blog too, for you to get a colorful pic from here. One southie to another. Cheers. 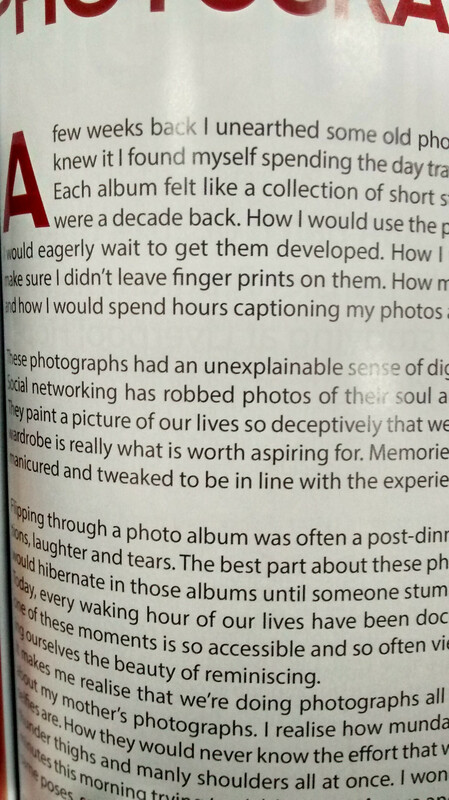 This was a beautiful piece, and it is actually something worth pondering upon – the loss of beautiful moments of viewing photographs due to the extensive popularity of “uploading photos ” on social networking sites. your work really inspires me. Great piece!! Loved reading every bit of it..
What a beautiful and a thought provoking read.